Collegiate and professional football games are 60 minutes long, divided into four quarters of 15 minutes each. In high school football, 12 minute quarters are usually played. The clock is stopped frequently, however, so that a typical college or professional game can exceed three hours in duration. The referee controls the game clock and stops the clock after any incomplete pass or any play that ends out of bounds. In addition, each team is allowed 3 timeouts in each half that they may use at their own discretion. In addition to the game clock, a separate play clock is also used. This counts down the time the offense has to start the next play before it is assessed a penalty for delay of game (see below). This clock is typically 25 seconds from when the referee marks the ball ready for play. 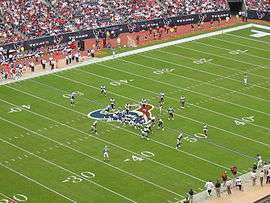 The NFL and NCAA use a 40-second play clock that starts immediately after the previous play ends, though for certain delays, such as penalty enforcement, the offense has 25 seconds from when the ball is marked ready. The purpose of the play clock is to ensure that the game progresses at a consistent pace, preventing unnecessary delays. Separating the first and second halves is halftime. Teams change ends of the field at the end of the first quarter and the end of the third quarter. In the NFL, an automatic timeout is called by the officials when there are two minutes left in both the second and the fourth quarters, and overtime; this is most commonly referred to as the two-minute warning. No such warning is normally given in amateur football, though if there is no visible stadium clock, the referee will give a two-minute warning (four minutes in high school). If a game is tied at the end of four quarters, overtime is played. During the regular season in the NFL, one overtime period is played (with each team receiving two time outs), and each team receives one possession to score, unless one of them scores a touchdown or a safety on its first possession. Sudden-death rules apply if both teams have had their initial possession and the game remains tied. If both teams are tied after the 15-minute overtime, the game officially ends in a tie. Overtime follows a three-minute intermission after the end of the regulation game. Prior to start of overtime, a coin flip is performed where the captain of the visiting team calls the toss. The team that wins the coin flip has the option to either receive the kickoff or choose the side of the field they wish to defend. Ties are rare in the NFL; the game between Washington and Cincinnati in London on October 30, 2016, ended in a 27–27 tie. There had been a tie in a game the previous week; prior to that, the last tie was on October 12, 2014. Beginning in the 2010 NFL post-season, a modified sudden-death system for overtime games was put into effect. The overtime rules were changed to reduce the apparent advantage gained by the team that won the overtime coin toss. Under the prior rules, the team that won the coin toss would usually elect to receive the ball, then gain just enough yardage to win the game by kicking a field goal without the other team ever touching the ball. The modified rules allow both teams to have the "opportunity-to-possess," with one exception. The exception occurs if Team(A) scores a touchdown (not just a field goal), or Team(B) scores a safety on the initial possession in overtime, then the game is over and the scoring team wins. But if a touchdown is not scored on Team(A)'s opening drive, or if they score only a field goal, then Team(B) is given an opportunity to possess the ball by either a punt, a kick, or by taking over on downs from Team(A). Of course, Team(B) could also gain possession by an interception or fumble from Team(A). Once the requirement for "opportunity-to-possess" has been satisfied by both teams, true sudden-death rules apply, meaning that whoever scores next wins (note that it's possible for a tie score to occur during overtime play under these rules). Various events may occur that constitute "opportunity-to-possess" even though a team may not gain full possession of the ball in order to run a play. For example, if Team(B) muffs a kickoff or punt return (i.e., drops the ball while attempting to catch it) which is then recovered by the kicking Team(A), then Team(B) is considered to have had their "opportunity-to-possess," and true sudden-death rules would then be in effect thereafter. Similar to normal overtime, following a three-minute intermission after the end of the regulation game, a coin flip is performed wherein the captain of the visiting team calls the toss. However, in post-season overtime, multiple 15-minute overtime periods may be played until a winner is declared. The first post-season overtime game played under the new overtime rules occurred in the 2011-2012 NFL AFC Wildcard Playoff game between the Denver Broncos and Pittsburgh Steelers at Sports Authority Field at Mile High, Denver, Colorado. Denver won the game on the first play in overtime, an 80-yard touchdown pass from Tim Tebow to Demaryius Thomas. NFL Europa, a defunct league run by the NFL, used a 10-minute overtime period, with the constraint that each team must have the opportunity of possession; once both teams have had such an opportunity, the overtime proceeds in a manner similar to the NFL's. Thus, if Team A has the first possession of overtime and scores a touchdown and converts their kick (thus being 7 points ahead of Team B), Team A would then kick off to Team B (In the NFL, the game would have ended with the touchdown, without a conversion being attempted). Team B would have to match or exceed the 7 point difference within this ensuing possession; exceeding it would end the game immediately, while matching the difference would result in a kickoff to Team A. From this point, the overtime is sudden death. The defunct United Football League had used this rule. The defunct World Football League, in its first season of 1974, used an overtime system more analogous to the system long used in international soccer. The overtime consisted of one 15-minute period, which was played in its entirety and divided into two halves of 7½ minutes each, with each half starting with a kickoff by one of the teams. The league changed to the NFL's sudden-death format for its second and last season in 1975. The defunct XFL used a modified Kansas Plan which, upon the first team scoring, required the opponent to score the same or greater amount of points in the same or fewer downs (i.e. if the first team scored a touchdown, and converted the one-point conversion in three downs, the opponent would have to match that touchdown and conversion in three downs as well). Each team started at the 20-yard line, but like high school, there were no opportunities for first downs. The league also banned field goals except on a fourth down. A scrimmage down begins with a snap, where the center throws or hands the ball backward to one of the backs, usually the quarterback. The quarterback then either hands the ball off to a back, throws the ball, or runs with it himself. The down ends when the ball becomes dead (see below). The ball is typically next spotted where the ball became dead; however, if it became dead outside the hash marks, it is brought in on the same yard line to the nearest hash mark. This spot becomes the line of scrimmage for the next play. In the case of an incomplete forward pass, the ball is returned to the spot where it was snapped to begin the previous play. A fumbled ball that goes out of bounds is declared dead and possession remains with the team that most recently had control of the ball. A member of the receiving team gaining possession of the ball on a kickoff may attempt to advance it as far as he can toward the kicking team's goal line before being downed. Once the ball carrier is downed, the play is whistled dead and the ball is placed by the officials at the point where the play ended; this spot then becomes the line of scrimmage for the ensuing play. A kick that travels through or goes out of bounds within the end zone without being touched, or is caught by the receiving team in the end zone but not advanced out of it, results in a touchback; the ball is then placed at the receiving team's 20-yard line, which becomes the line of scrimmage. A kickoff that goes out of bounds anywhere other than the end zone before being touched by the receiving team is an illegal kick: the receiving team has the option of having the ball re-kicked from five yards closer to the kicking team's goal line, or they may choose to take possession of the ball at the point where it went out of bounds or 30 yards from the point of the kick (25 yards in high school, and in college as of 2012), whichever is more advantageous. For statistical purposes, the player who advances the ball into or catches it in the end zone is credited with the touchdown. If a forward pass was thrown on the play, the quarterback is also credited with a passing touchdown. In the extremely rare event that the offensive team scores a safety on the try, it receives one point. In college football, this can occur when, for example, the defense gains control of the ball and attempts to advance it, then fumbles it out of bounds in its own end zone. Prior to 2015, only the offense could score a one-point safety in the NFL as the try ended once the defense gains possession. As of 2015, either team may score a 1-point safety due to the rule changes permitting the defense to return a try after a turnover. The game clock is not advanced during a try, however, the play clock is enforced. A delay of game penalty, false start, or similar penalty, by the offense results in a 5-yard penalty assessed for the try. Typically, penalties charged against the defense give the offensive two options: half the distance to the goal for the try, or assessing the full penalty on the ensuing kickoff. Since the try is not timed by the game clock, if a touchdown is scored as regulation time expires (and game clock subsequently reads 0:00.0), the try is still allowed to be conducted. This instance is relatively common as teams score a game-tying (or game-winning) extra point after regulation has expired. A free kick (see above) may be taken on the play immediately after any fair catch of a punt. In the NFL, if the receiving team elects to attempt this and time expired during the punt, the half/overtime is extended with an untimed down. The ball must be held on the ground by a member of the kicking team or may be drop kicked; a tee may not be used. (High school kickers may use a tee). This is both a field goal attempt and a free kick; if the ball is kicked between the goal posts, three points are scored for the kicking team. This is the only case where a free kick may score points. This method of scoring is extremely rare, last successfully completed in the NFL by Ray Wersching in 1976. It is only advantageous when a team catches a very short punt with very little time left. Note that a team is unlikely to be punting with only a few seconds left in a half or overtime, and it is rarer still for punts to be caught near field goal range. The officials' signal for a successful fair catch kick is the same as for a field goal. In the NFL, a number of rulings can be reviewed by officials or challenged by coaches (see Instant replay). If a coach wants to challenge a play, he must do so before the next play begins, and he does so by throwing a red flag similar to the officials' yellow flags. Coaches are allowed two challenges per game and are granted a third if their first two are successful. The team loses a timeout if they lose the challenge. Therefore, they cannot challenge if they do not have timeouts. Plays within the two-minute-warning and overtime cannot be challenged; any review must be initiated by a replay official off-field. The referee performs the actual review via a video screen on the sideline. The referee will announce the result of instant replay reviews over his wireless microphone. Sudden death using basically the same rules as in regulation. Except if the team that receives the kickoff scores a field goal on its first possession, it then kicks off to the opposing team with an opportunity to score; if the score is tied again after that possession, true sudden death rules apply. During preseason and regular season games, only one overtime period is played and the game can simply end in a tie; during playoff games, multiple overtime periods may be held until one team scores. 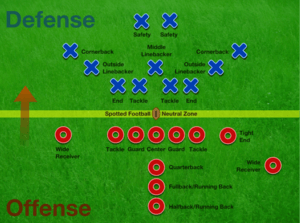 Each team is given one possession from its opponent's twenty-five yard line with no game clock. The team leading after both possessions is declared the winner. If the teams remain tied, overtime periods continue; games cannot end in a tie. Starting with the third overtime, teams are only allowed to attempt two-point conversions after a touchdown. Scoring plays, turnovers, and plays during the final two minutes of each half and all overtime periods are subject to booth review. Coaches are issued two challenges (with the option for a third if the first two are successful) to request a review for all other plays All plays are subject to booth reviews. Each coach gets only one guaranteed challenge. If that challenge is successful, a second challenge is allowed. ↑ "The Unofficial Beginner's Guide to Football". Retrieved October 1, 2012. ↑ "Vikings, Packers Play To Tie". ESPN. Associated Press. November 23, 2013. ↑ Bell, Jarrett (April 2, 2008). "Coin toss switch tops list of NFL rule changes". USA Today. Retrieved September 28, 2010. ↑ "NFL moves kickoffs to 35 yard line; touchbacks unchanged". Retrieved August 15, 2011. ↑ 2007 Official Rules of the NFL. Triumph Books. October 1, 2007. ISBN 978-1-60078-028-8. ↑ "NFL Rules Digest: Try". Retrieved February 4, 2014. ↑ "NFL Rulebook, rule 11-3-2.c". Retrieved September 21, 2015. ↑ "What You Need To Know About The New NFL Rule Changes – 2011".